A damp basement can be the bane of a homeowner's existence. It limits usage of the basement area and hurts resale value. As many homeowners realize, there doesn't have to be water standing in a basement for there to be a damp basement condition. A white, chalky substance, efflorescence, on basement walls indicates a moisture problem, as well. And locating the cause can be tough, not to mention fixing it. This article will outline some solutions for moisture problems in basements with concrete block or poured concrete walls—solutions ranging from simple and inexpensive for minor problems, to more complex and costly solutions for major problems. But first, let's find the source. The first thing to consider is the exterior of your home. If the ground around your home slopes toward the foundation, then rain water will seep toward your home and seep through the walls. That's a problem. 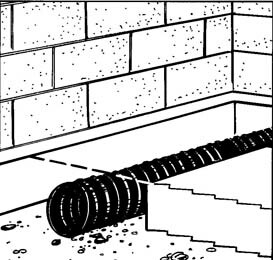 And if your rain gutter pipes dispense water right near the foundation, that too is a problem. Solve the gutter situation by adding ground extensions (outspouts) to your downspouts. They'll carry water well away from the base of your house (and if you don't have gutters at all, it's time to install some). As far as the slope of the ground goes, you'll need to haul in some water-resistant clay, topsoil and sod to build a grade that slopes away from your foundation. Rent excavation equipment and a sod cutter to make the job go more smoothly. The next heavy rain following these repairs should tell you if your problem is completely solved. If the dampness is still there, but quite minor, you can consider an additional measure. Apply a commercial concrete patch material to the cracks from the interior. For shrinkage cracks, as in between the wall and floor, use a hydraulic cement. Then apply a coat of sealer to the repair areas. Finally, apply a full coat of sealer to the entire wall (which gives the repair area two coats). If these tactics don't keep the dampness out, your problem is more serious, and your options more difficult and expensive. For concrete block walls, you can install interior drain tile to draw water through the blocks, under the floor and into a sump pump system to be discharged away from the house. This tough job involves breaking and removing a foot-wide section of your concrete floor all around the base of the wall. While concrete breaking equipment can be rented inexpensively, this job is not easy. Otherwise, a water dam system can be installed right on top of the floor, tight to the wall, to capture seepage and carry it to a sump pump—less expensive, but typically not as effective. Exterior tile installation is even more difficult and should probably be left to a professional. If you have any questions, or would like to find out how rental equipment can help make some of these jobs easier, stop by the store.